Buying one Quad4 is like buying 4 independent processors. Inside the Quad4 is a multi-effects processor that is multi- talented, and while most of us can't do more than one thing at a time, the Quad4 can do 4. 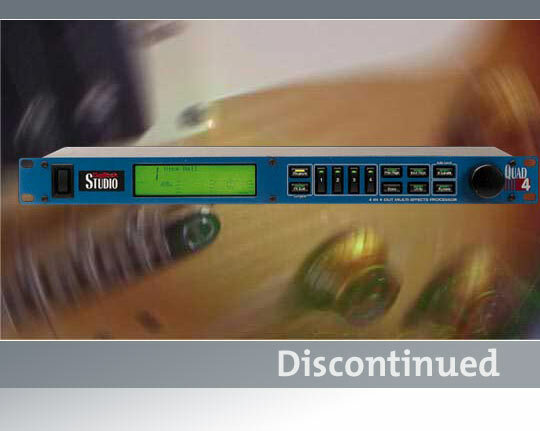 Why did we put the power of 4 multi-effects processors into one unit? So you, too, would be able to do more than one thing at a time. The Quad4 features 4 completely independent inputs and outputs that give you the power of four independent mono processors or two true stereo processors. Imagine the power to process two true stereo sources simultaneously without sacrificing control.